Amid mounting pressure to keep students in school, Roosevelt High School administrators pledged Thursday to support the development of a new discipline policy focused on positive behavior over punitive suspensions. At a lunchtime rally, principals from Roosevelt’s six small schools in Boyle Heights signed a letter pledging to support the new policy’s first step: teaching expectations for student behavior. The expectations are built around six traits voted in by more than 900 Roosevelt students as necessary for success -- respect, intelligence, dignity, empowerment, resilience and support and include such specific behaviors as following teacher directions, waiting patiently in lunch lines and avoiding profanity. The policy emphasizes rewards for students who meet the expectations as a more effective way to transform behavior than harsh punishments. And building the expectations into the entire school culture is also seen as more effective than working with individual students. For students with deeper problems, Roosevelt recently signed agreements with providers of drug counseling, violence prevention and anti-gang services. Roosevelt students gave the new direction a thumbs up. Eduardo Fernandez, 17, said he was suspended last year for arguing with his biology teacher over his failure to finish his homework and, at home, played video games all day. Although he enjoyed his day off from school, he said, he would have preferred someone to talk to him and calm him down instead. His friends, Brian Medina and Aris Perez, both said suspending students only makes them fall behind in school and that assigning them community service, such as cleaning the campus, would be a better consequence. The L.A. school board directed all campuses to introduce the positive behavior policy in 2007, but many have not done so. It was never fully implemented at Roosevelt, according to Ben Gertner, principal of the school of communications, new media and technology. But he said he wanted to revive it after coming to believe that simply sending students home failed to treat the problem’s root causes. 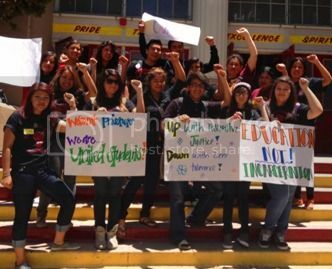 Gertner is working with United Students, a campus group affiliated with InnerCity Struggle, a nonprofit based in East Los Angeles. The student group held a town hall meeting last year asking political and educational leaders to support a new discipline policy and helped create a campuswide team to do so. After surveying 900 students, the group came up with the behavior plan. The Partnership for Los Angeles Schools -- the nonprofit that runs Roosevelt, started by Los Angeles Mayor Antonio Villaraigosa -- helped acquire a $12,000 grant from the California Endowment for campus murals and posters that will tout the school’s chosen character traits. Roosevelt’s actions reflect a growing movement statewide to seek alternatives to out-of-school suspensions, which, advocates argue, sours students on school and sets too many on a downward spiral toward academic failure and, eventually, crime. Although state law requires suspensions for students involved with weapons and drugs, more than 40% of them are imposed for willful defiance, which could involve talking back to teachers or failing to wear the school uniform. State legislators have introduced several bills aimed at restricting suspensions for willful defiance, and L.A. Unified Supt. John Deasy has also pushed his staff to find alternative ways of handling misbehavior.